Not really sure what I think. Picked up from a shelf of second hand books in a Pembrokeshire cafe. Last read from the library when I was 10 or 11. 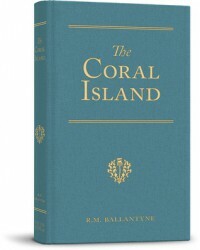 I loved the first half - almost a manual on how to survive on a coral island in the South Seas. Enjoyed the pirate interlude as a bit of a change. Loathed the last bit of cannibals and christians. However the language is delicious throughout.